If you’re anything like me, you love boating the most when you are with friends and family. Something about being on the water surrounded by your love ones makes the entire experience more enjoyable; the fresh air, warm sun and a calming ocean breeze, why wouldn’t you want to bring the whole family along for the ride? It is always fun to have the everyone on board, especially the little ones! However, safety is more important than fun when you are out with your loved ones on the water. Unfortunately, they are the most susceptible dangers out on the water. It is of the utmost importance to not only keep a watchful eye on the infants and toddlers but to also follow the U.S. Coast Guard Office of Boating Safety regulations. According to the U.S. Coast Guard’s Office of Boating Safety, an infant should not travel on a watercraft until they weigh at least 18 pounds and can wear a life jacket. Most babies will reach that weight when they are between 4 and 11 months old. While it may seem obvious, the first rule of infant boating safety is that from before the time they step on the dock to when they are walking off, they need to have their life jackets on. Under no uncertain terms should their life jacket come off during the entire trip. 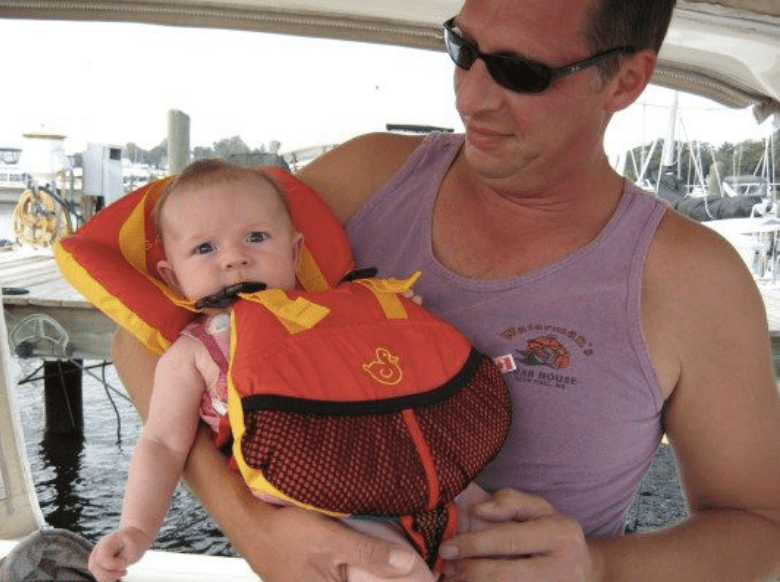 It is important to have a infant life jacket for under 30 pounds, they are specially designed for infants with a built in “heads up” cushion which keeps the infant’s head up and out of the water and also includes a built in loop handle at the top. It is imperative to be sure that the life jacket is fit snuggly and strapped in completely. When the boat is in motion, it is important to place the infant in a proper spot to insure maximum safety for your infant. When cruising, place an infant on a floating device in case of an emergency. It is not safe to strap them into a car chair or another non-floating device on the watercraft. Just like being out on the water, there are also dangers that can arise with getting the baby on and off the boat. Here are a few ways in which to safely transfer your baby to and from the boat. 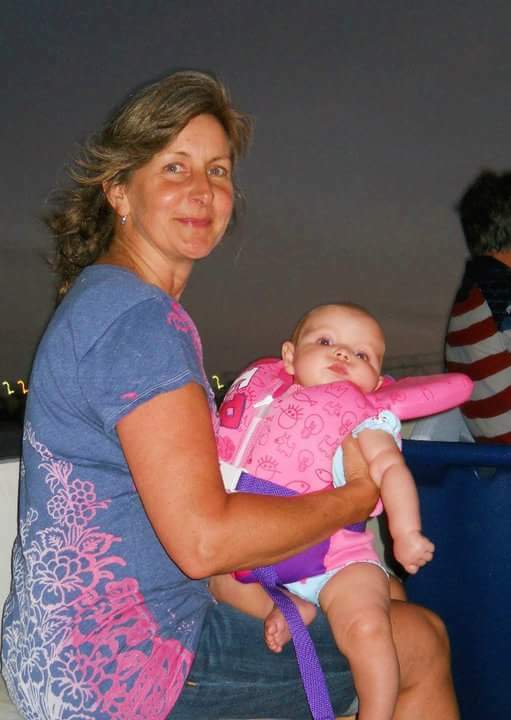 My favorite way to transfer the infant is to hold him or her tightly while walking on and off the boat while someone is on the dock and boat to steady you in case of slipping. Another method is to hand off the baby to someone already on or off the boat. It is important to make sure that you hand off the infant when the gunwale (edge of boat) is touching the dock, never hand the child off if there is water under the transfer. Always, always, always make sure there is shade available for the little ones. The UV rays are more intense on the water because they are bouncing off waters surface and shooting back at the boat occupants instead of being absorbed into the ground.